No one wants to be left behind … especially when it comes to our money. We all know we should be saving up for a healthy retirement. And hopefully you’re making strides to do so! But have you ever been curious about how you’re doing compared to your peers? 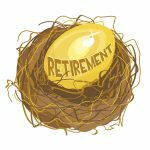 Perhaps you’ve wondered about the average retirement savings by age and where you should be at by now with the size of your nest egg? 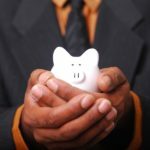 Unfortunately the way things go, there is a big difference between how much you SHOULD have saved by now and how much your peers actually have saved for retirement. On average most people don’t seem to be nearly as far along with building their life savings as they should be. So to really see how you compare, in this post we’re going to focus on where you “should” be because that’s where you’ll get the most amount of benefit. You started saving for retirement at age 25. 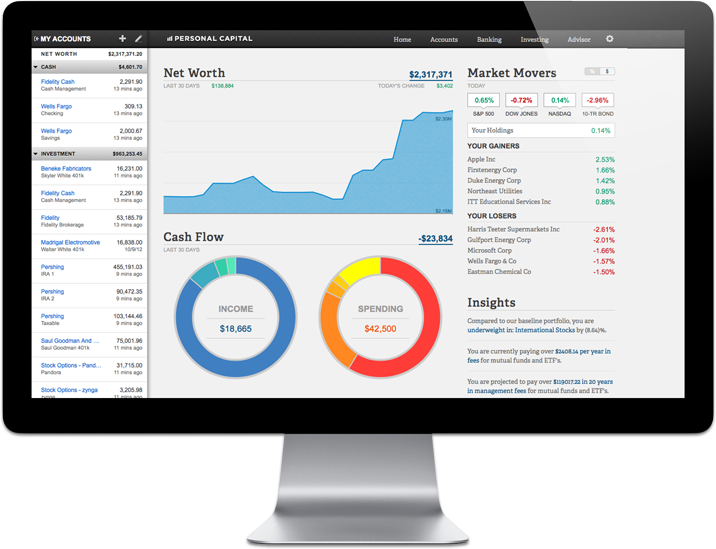 You kept your investing simple and only contributed to funds that follow the stock market index returning an average annualized return of 8% per year. 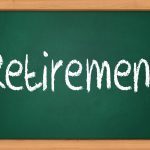 You plan to retire after 30 years of working (at age 55). 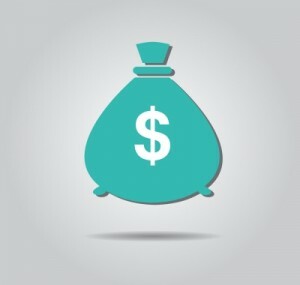 By the time you retire, you estimate you’ll need about 80% of what you’re earning now. 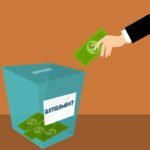 When you do retire, you’ll withdraw 4 percent each year from your nest egg for income. For ease of this example, we’re not going to compensate for inflation. 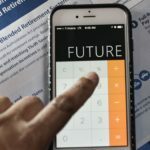 With the assumptions above, we can now predict exactly how much money you should have for each year you save for retirement. Our target nest egg size (i.e. our total retirement savings) will need to be $60K x 0.8 / 0.04 = $1,200,000. 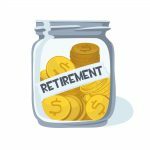 To get there in 30 years, we’ll need to save approximately $10,952.92 each year (taking the effects of compounding investing into consideration of course). The above numbers help out nicely if you’re one of the many “average” American households out there. But what if you don’t make $60,000 per year? What if you earn more or less than that amount? Interestingly enough, when you look at the numbers in the graph above in terms of percentage rather than an actual dollar figure, those same percentages work for ANY income level (providing you’re still following the rest of the assumptions we’ve used). Here are the average retirement savings by age again in terms of percentage rather than absolute dollar figures. 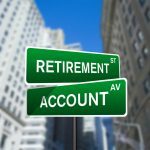 All you need to do is pick how large you want your retirement savings to be and then multiply the percentage by that amount to see where you should be at. 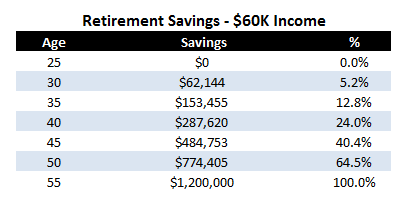 For example: If I earn $100,000 per year rather than $60,000, then my target total retirement savings should be $100K x 0.8 / 0.04 = $2 million dollars. 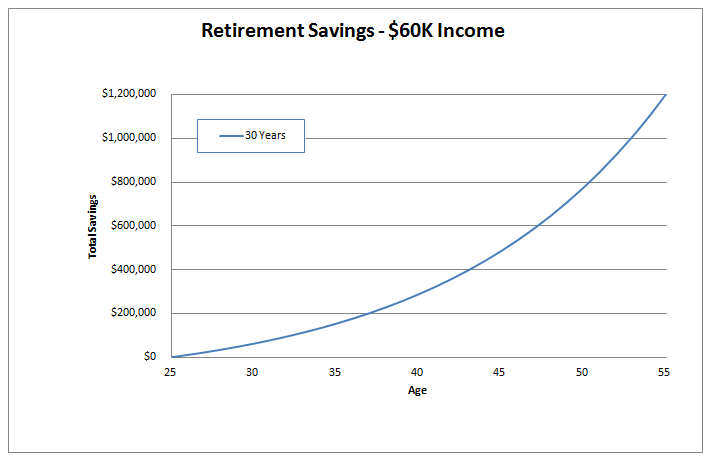 So by age 40 (15 years into saving) I should have approximately 24% of $2 million dollars saved = $479,367. 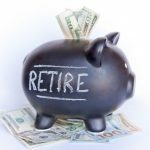 Since we can express retirement savings by percentage rather than absolute dollar figures, there’s really no reason we can’t extend this model to different age groups. 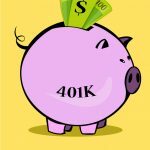 What if you’re starting to save for retirement in your 30’s and got a late start? What if you started really early but still plan to work for 40 years because you love what you do? For example: If I’m 40 years old, have NO retirement savings, and want to retire in 20 years by age 60, then I’ll need to follow the red line. That means I’d have to save up very rapidly with contribution levels of approximately $26,222.65 every year for the next 20 years. If my current income is $40,000 per year, we could reasonably assume I’ll need a nest egg of around $800,000 to meet my goals. 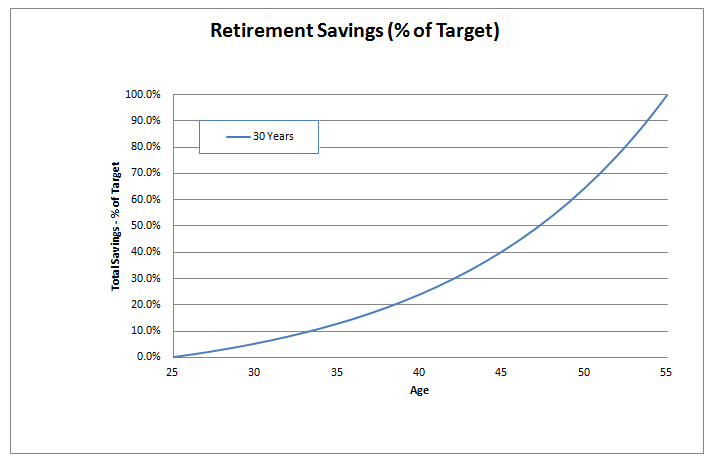 So using the graph by year 10 of saving, I should have 31.7% = $253,251 set aside. Here’s another example: If I’m 25 years old and plan to work another 40 years until age 65, then I’d follow the light-blue line. Because I’ve given myself so long to save for retirement, I won’t need to contribute so rapidly to meet my goals. 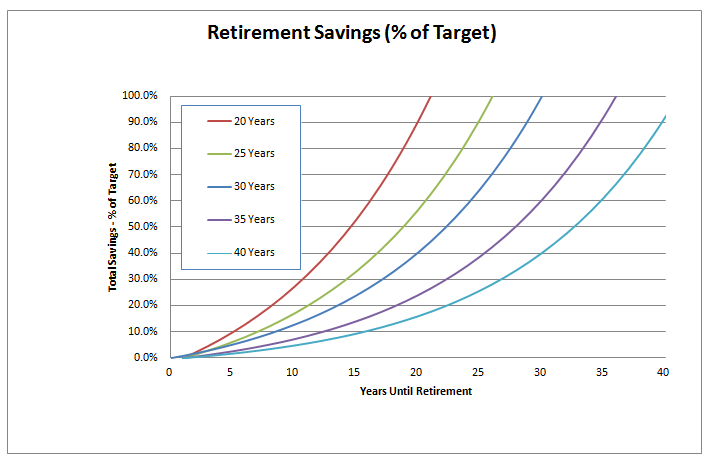 20 years into saving, my nest egg would only need to be 17.7% full, and I’d still be on track. That’s one of the beauties in starting your retirement savings at as early an age as possible! 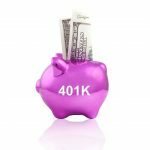 Sometimes it can be a chore all by itself to keep track of all your different retirement savings accounts (your old 401k, new 401k, IRA’s, personal savings, etc) and know exactly where you stand relative to everything we’ve talked about here. What a pain to have to log into 3, 4, 5+ accounts just to see how much each one is worth! Fortunately there are free services out there like Personal Capital that will easily take care of this problem for you. What they do is provide you with an accommodating one-stop place to view and manage all your accounts together all in one place. As a matter of fact, you can even set up your account to email yourself convenient periodic summaries of your account balances. 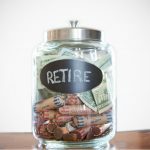 That’s a huge time-saver and it really helps me to gauge where I cam when I’m thinking about my retirement plans. So do yourself a favor – Click on the image below to sign up today for a free account and let them do all your tracking for you. It’s extremely important for me to point out that all of these calculations and models are just guidelines; nothing more. The major caveat here is that our investments DON’T grow upwards every single year. They fluctuate up and down in value as the stock market responds to our economic climate. Therefore if you plan to invest in mutual funds that hold lots of stocks (as most people do), then you can expect many, many, many fluctuations over the years. Does that mean the exercises we went through above are worthless? Of course not. We’re just using “average” figures to help us get a general idea of where the average retirement savings by age should be at. If you’d like to build a more bullet-proof nest egg, save above what you think you’ll need and invest in less risky investments that won’t fluctuate in value as much.